The Crims will release 3 albums on record store day. I must have more, and so I shall! Available for pre-order via DGM and Burning Shed. This is the first full concert release by the current line-up of King Crimson. This Official Collectors’ Bootleg captures King Crimson on a single night in the middle of the band’s Canadian tour in November 2015. With the exception of one small edit following an announcement before the band take the stage, the running time of this concert is exactly as it was heard in the hall by those fortunate enough to have been there. Even by the high standards set by King Crimson’s current line-up, this concert was agreed by all involved to have that extra special ingredient, making it the perfect choice when seeking an official release to counter the poorly recorded bootlegs that have begun to circulate. 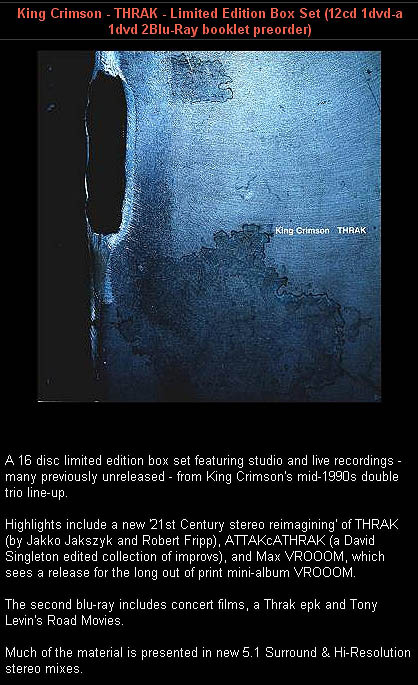 Featuring the recorded debut of new material such as ‘Meltdown’ & ‘Radical Action’, the three drummer percussion pieces ‘Hell Hounds of Krim’ & ‘Banshee Legs Bell Hassle’ & a variety of King Crimson classics – including material from “In The Court Of The Crimson King” performed & recorded live for the first time in decades, a return to the live set of ‘Easy Money’ for the first time since 1974 & more recent powerhouse pieces such as ‘Level Five’ & ‘VROOOM’ – all material that the seven piece King Crimson has made very much its own in an absurdly short time of touring. The first release by the current band was the 2014 mini-album, “Live at the Orpheum”. This autumn, they will be releasing their long-awaited and much anticipated first major album – a comprehensive live release, taking the best performances of each song from the extensive set list (which changes nightly) & also including footage of selected performances. It will be released to coincide with the band’s 2016 European tour, which begins in the UK with two concerts at the Waterside Theatre in Aylesbury on September 4th & 5th, the band’s only UK dates for 2016. Just finished listening to it. Starts off O.K., but, then, keeps getting better. Disc 2 majorly rocks! and "80's live at fregus" (looks like it's actually "freJus"). these things have never touched my player. Have you been to this Toronto gig, w/ Sabby? There's also a download of the full show available at the dgmlive site. I'll be buying it soon. Very soon. I own both of them on dvd. You should check them out! No. Wasn't able to make it. That's the one I bought, yesterday. The popularity of the King Crimson show in Toronto set live on Monday has been tremendous. So tremendous in fact that it tripped a limit on the number of orders the e-commerce provider can process on our behalf in a given day. They are aware of the problem and working to get our order processing facilities back up and running. Many thanks for your patience and we'll let you know as soon as this frustrating situation has been resolved. I'm sooooooooooo looking to get this ... the Orpheum CD was very disappointing when you saw the whole show, but my imagination had that show imprinted and it was magnificent in Seattle. Sadly, originally Robert was not interested in the live shows being released, and I think he has had a change of heart. The line up of the material is almost the same as Seattle I think. Downloaded and listening. God! This IS a tasty little sucker! I'm definitely going to check this out! Just listened to Easy Money>Level Five>The Letters>Sailor's Tale>Starless with cranked volume on the way home from work. Having a little trouble following this thread. Please tell me what exactly what to buy and where to get it (download or CD). I was at the NYC shows and was blown away. Would love recording of that show or similar set list. I added information about a new KC release, "Toronto, 2015", to an existing thread. It's a complete concert release, available for download now, or for cd pre-order for I believe March 17. I purchased the download yesterday. "This autumn, they will be releasing their long-awaited and much anticipated first major album – a comprehensive live release, taking the best performances of each song from the extensive set list (which changes nightly) & also including footage of selected performances. It will be released to coincide with the band’s 2016 European tour, which begins in the UK with two concerts at the Waterside Theatre in Aylesbury on September 4th & 5th, the band’s only UK dates for 2016." As those lucky enough to have seen it live will know, the opening chord of this song are often accompanied by an intake of breath. Like an incoming tide of realisation, all the variations on "I never thought I’d hear this live", or "crikey, this is my favourite", "OMG I’ve died and gone to heaven" and a few more sentiments besides. "It is something of a truism in the history of Crimson that any show that is filmed will not be one when heaven meets earth and the angels descend. The presence of cameras and cameramen iintroduces an intrusive element into the relationship between the artist, the music and the audience. Our solution was to return to the concept of "BootlegTV" and prioritise the music and the performance rather than the pictures. We embedded a single cameraman (the long-suffering Trevor Wilkins) on this tour, and he filmed every night with a a series of cameras hidden discreetly on the stage where they would intrude on neither artist nor audience. The compromise is thus in the visuals and not in the music." The set was recently described by John Kelman in "All about jazz" as "the definitive live Crimson release from the definitive live Crimson lineup; a landmark recording from a group whose discography is filled with them." Just saw KC at "The Falcum" in Copenhagen. It was pretty close to epic. The physical effect of three drummers is not to be underestimated. Long show with a break. The new "Radical Action to Unseat the Hold of Monkey Mind" 3CD/1BluRay is a worthy companion to the experience. I'm buying the '80's box when it comes out next week. It's the perfect release for me as I rebuild my record collection. I didn't know KC at all until Discipline (mainly because of Belew) and the '80's remain my favorite era. I like everything since and most before but I'm really looking forward to this. At $140.00 or so it's a really good value to me too as I replace those CDs and DVDs that I sold off years ago during leaner times. Someone at Amazon.ca must have a strange sense of humour. 1000% agreed! The KC show in Berlin was the best concert I witnessed in decades. I have RRAtUtHoMM for a couple of weeks now and can't get enough of that. It is a pretty good representation of the concert experience.